Melbourne Lifestyle Blog: A casual farewell with dinner at Tusk. A casual farewell with dinner at Tusk. So M, my blog’s most featured friend, has left. Gone to another country to fulfil her dreams and enhance her already glowing education. Yes, she is very intelligent, and great company too. So look out for guest blog posts from a foreign location when she settles in to her new home. I would like to write that we had an indulgent meal together as our last before her great adventure. But instead we caught up on Chapel Street at last minute and wandered around, while hungry, settling for the first place we saw that looked popular enough to be decent. So we ended up at Tusk. Crowded, lively and close, with a table outside with the rest of the crowd. I ordered the veggie burger. It came on a thick bun (that may have been toasted to disguise its staleness), with so many fillings that I wondered how I would eat it. Hands or knife and fork? I tried hands and then change about three quarters of the way through. 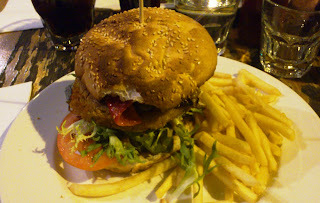 The actual burger was shredded vegetables, only just soft enough to be considered cooked. Crunchy fries were on the side. The atmosphere remained lively, but we got colder as the night set in. It was a casual farewell, but a fitting one with much conversation to make-up for all the meals M and I will not be enjoying together over the next year.